Even though life has been a bit difficult lately, I’m happy to say that there are some exciting things on the horizon that I’m really looking forward to. This weekend I’m going deep sea fishing with a few of my good buddies. I’ve recently discovered that I really enjoy fishing, especially deep sea fishing. It’s going to be a great guy’s getaway. 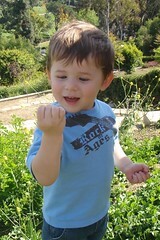 I can’t wait ’til Kai gets a bit older and I can take him too! The next bit of news (and probably the news I’m most excited about) is that I will be sending my band’s third full length CD to press this week. Even though the band hasn’t “officially” been together for years, we’ve been getting together here and there to be creative and have fun. We ended up recording a full length CD in the process! I think it is by far the best stuff we’ve ever done. We spent all our creative energy on the songwriting and recording instead of preparing for live shows, so the final product has an increased level of maturity and professionalism over previous projects. I don’t know what we’ll do with the CDs yet since the band isn’t performing live, but I’m excited about it anyways; even if they all sit in my garage for the next couple years. 😉 I’ll post some links to some samples of the music soon. Actually, the last song on Monica’s Memorial Slide Show is a song from the new CD. In fact, the first day we started recording (almost 2 yars ago) was the day we got back her biopsy results. We were all pretty upset, but she insisted that we continue recording. The whole time she was sick she encouraged me to continue recording. I always appreciated how supportive she was of my music. She gave up a lot of time to allow me to write and record music while she took care of Kai and dealt with the chemo fatigue. I consider the CD as a gift from her that she would not let me refuse. I know she would be proud of it. The last bit of news is that I bought an “All-You-Can-Jet” pass from Jet Blue for the month of September. Jet Blue is currently having a promotion that for one price, you can fly as much as you want from Sept 8 – Oct 8. Get ready, ’cause I’m planning on taking many of you up on offers to come visit you in your town! I don’t have any definitive plans yet but I know I will be needing a lot of babysitters, so if anyone is available, let me know. Thanks for all the prayers of support and encouragement. Last week’s low has been replaced with a bit of optimism for the near future, and I know that it has everything to do with your prayers. Today was the first day in a long time that I didn’t have something specific planned or something unfinished that couldn’t wait. I left Kai’s sippy cups unwashed. They can wait ’til the morning. I’m even writing this post at a decent hour. It was nice, in a way, to have a free moment. As things start to slow down and life starts to seek its equilibrium, I wonder what’s next. Most of my life has been blessed to a point where I never really felt penetrating, genuine sadness. Sure I had a few low moments in life, but never anything that didn’t pass quickly. Obviously, this is different. Since Monica passed, I have been experiencing that deep sadness. Somehow I’ve been able to manage it though. I’ve been able to justify that, since anyone would be sad in this situation, it’s ok to allow those emotions in. It would be more troublesome if I didn’t allow myself to feel those emotions. It isn’t always comfortable or “fun”, but I’ve decided it’s healthier to feel the sadness than to repress it. That cerebral justification has allowed me to cope with the depth of the emotion. Recently, though, I realized the recipe has changed. A new ingredient has been added and it changes the flavor of the entire mix. Recently I’ve felt loneliness. I’ve experienced loneliness before in life, but it was never mixed with sadness; certainly not deep, genuine sadness. It’s a potent mix. How are you supposed to not feel lonely when you still feel lonely around other people? The rest of this week I’ve got a lot of plans, so I’ll be keeping myself busy. That seems to help in the short term. Beyond that I have to decide whether I want to continue slowing down, or keep my schedule packed tight. Since I know everyone is wondering how Kai is doing, I would say he is doing better. His temperament is evening out a bit. He still talks about Mommy a lot and he says he misses her, but he doesn’t seem to be as emotional when he talks about her. 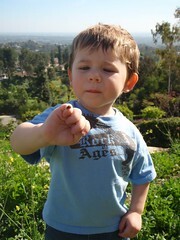 He has been asking me lately if I will go to the clouds with him so we can see Mommy in heaven. It makes me smile and cry at the same time. Kai Caught His First Fish! They get so big so fast! Grandpa Spence (Monica’s dad) took Kai fishing this week and he caught his first fish. I can hardly believe it. I hope they took lots of pictures. Kai was so excited about fishing with a “real” pole. I wish I could have seen his face when he caught it. I think she deserved fireworks. Monica’s parents and sister came down, and so did my family from Fresno. Kai actually had 3 birthday parties for his 3rd birthday. The first was a bit of a surprise. The ladies at work threw Kai a party and it was great. They were so thoughtful and generous, and showered Kai with gifts. The second was in his “classroom”. His teacher made him the coolest 3-year old birthday hat ever! Check it out. The finale was at Chuck E. Cheese. He loved it. 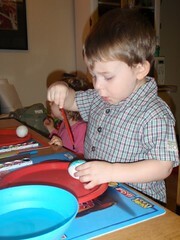 I’ve posted some pictures of his party and our Father’s Day outing. Anyways, instead of trying to organize a list and manage invitations, we are inviting all who would like to come this Saturday, June 20th to an informal birthday gathering at Chuck E. Cheese in La Mirada. We will be there at around 2:00pm. No need for presents or anything, just a fun get together for anyone who wants to celebrate Kai’s birthday. All food, tokens, etc. is up to you. If you have kids, of course bring them. If you just feel like a big kid yourself, that’s fine too. These are some of the top questions that some of you are asking, so I thought I’d think about them a little and see if I can answer them here. The simple answer is that he’s having a hard time. He daily talks about or asks about mommy. The first couple of weeks his sadness was obvious, and he often would get angry. It tore my heart apart every time, and in some ways I was more hurt by Kai’s frustration and sadness than my own.Lately, he seems to be less angry about her being gone. I’m a little concerned though, because when he says, “mommy’s dead” (which he says every time he talks about her), he adds a little forced giggled at the end. He might say something like, “Hey, those are mommy’s keys. Mommy’s dead. She’s in heaven… (little forced giggle)”. I reply with something like, “Yes, mijo. Mommy’s in heaven. Jesus is taking care of her. We miss her, but one day we will see her again.” He usually replies with something like, “Yeah… she’s dead (little giggle).”On the other hand, he has definitely gotten a lot more whiny and is acting out more than ever before. I think a lot of that is simply him being a 2 year old going on 3, but as a concerned parent I still can’t help but wonder how much of it is his little broken heart. 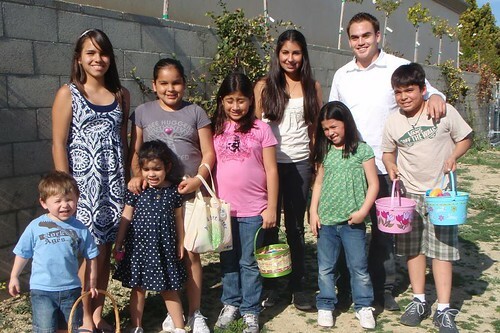 Typically I think people are asking if we’ll stay in Whittier or if we’ll move back to Fresno where my family lives. Since my main concern is Kai’s stability and ability to cope, I want to do everything I can to keep things as consistent and “normal” for him as possible. That means we are staying here in Whittier. Kai loves his teacher at day care and she has really been great for him. I am so grateful for her and the support and attention the school gives Kai. Actually, the network of people that have come forward to help us through is amazing, and it wouldn’t make any sense to leave.At the same time, as you know, one of my bosses died two days after Monica. Since I worked closely with him, I feel like I need to do everything I can to hold the fort and come through for my co-workers and my other boss. The company that I work for is a small business and we are like family. I could never fill his shoes, but I can certainly do my part to keep things moving. Fortunately things are going smoothly as I take on some new responsibilites. What do you need/Is there anything I can do? This question has been one of the hardest for me to answer; mostly because I just don’t know yet. Today is the 29th day, and I still don’t know. For sure I’ll need babysitters, but otherwise I don’t know. What am I supposed to need? Do I need something that I just don’t see yet? Sometimes I wish people would tell me what I need so I can go after it.I’ve thought about it a lot actually. The first thing that comes to mind is sleep. I’m physically exhausted and it has nothing to do with exertion. I’ve always had a problem sleeping; when I lay down my mind goes crazy. Now my thoughts stray to a more acute awareness of Monica being gone. Even tonight I tried to go to bed early and felt so sad/awkward/scared knowing where my thoughts would lead, that I decided to write this post instead. Hopefully I’m not totally rambling, ’cause I’m so tired even my eyes are blurred. The night before I called a buddy who I know hasn’t been going to bed early and we chatted til it got really late. ACtually, the worst part has been Kai’s new eratic sleep schedule. He’s been waking up several times a night and getting up each day about two hours earlier than normal. His teacher even told me today that he’s been taking wonderful naps at school lately. Hmmm… I wonder why? !The other thing I think I need is a new dream. For most of my formative years, I always had the dream of being a professional musician. As I got older my dreams changed, and I didn’t need a band to feel “fulfilled” or like I was doing something worthwhile. I was happy to move on, and taking care of and growing with my family became my dream. I loved the role of husband and dad. Now, that dream is gone. The role of dad is not the same with mommy gone, and although I still will do everything I can to be the best dad I can be, it doesn’t much feel like a “dream” anymore. In the meantime, I feel lost. What am I doing here; what’s my purpose? Who am I? Who do I want to be? I don’t really know anymore. It’s one of the most frustrating feelings I’ve ever had. For the most part: yes. Monica did not have life insurance, but I have a good job and we had saved a little to buy a house, so I’m not in ruins. Since we were a two income family, however, I will most likely have to make some changes at some point. I bought one of those money manager computer programs and sucked in the incoming and outgoing data from the last several months. Without Monica’s income I am currently cash flow negative. I will certainly tighten the belt in some areas and make it work, but I may have to find a smaller apartment or something. Kai will receive a small monthly benefit ( about ~$200) from social security until he’s 16 so that will help. Hmm. How do you answer that? There’s the safe “hanging in there”, or the “some times are better than others”, but I think those are more like polite responses. I don’t think anyone (others or myself) really has the time to answer that in passing anyways, and I’m not sure that most would really feel comfortable really hearing it. When I was in third grade, a local Indian chief from a San Joaquin valley tribe called the Yokuts came to visit our class. He came to talk about his culture, but the one thing I’ll never forget that he talked about was how our society is willing to make a greeting out of an important question like “How are you?” and not expect anything meaningful in return. His argument was that we ought to really care how people are doing, but instead we’re satisfied with just being polite. I don’t think he would be happy with me as I give my safe/polite answers. 😉 I don’t mind the question and I appreciate people’s concern, but I’m usually not ready to give an answer without pulling up a chair and a box of puffs tissues. My mom is a trooper. She was here for over a month. She got here as Monica took a turn for the worse and stayed ever since. Today she had to go back though; so the training wheels come off and Kai and I have to find our own way. In some ways it’s a good thing, and in others it is … not so good. My mom was great with Kai and made my life so much more manageable as I have been trying to navigate the waters of confusion. She also did a lot of cleaning and straightening up. Things already feel overwhelming at times, and I am at least a little bit nervous about household things piling up. On the other hand, I’m a bit anxious to get rid of at least a little uncertainty in life right now, so I think having some kind of routine would be good for me as much as it would be for Kai. In the meantime I just keep telling myself, “One day at a time”. So my dermatology appointment went pretty quickly ending with a punch biopsy and the waiting game. He said it would take about 7-10 days to find out the results. He said he put a rush on it saying that patient’s treatment depends on the results. So hopefully we’ll hear back sooner than 7-10 days. I was so thankful to have Sunshine there with me as I was getting the biopsy. She changed her schedule at the last minute so that I didn’t go alone. It was a blessing. After the appointment, I received a phone call from my doctor’s office saying that I would need another transfusion. Just what I didn’t want to hear. I was in a restaurant and didn’t want to cry. When I don’t want to cry, the muscles in my abdomen tighten up and I am in a lot of pain. That happened to me at that point. I wanted to scream, and for some reason I couldn’t relax to stop the pain. Sunshine was with me, she was very calm, and I finally relaxed. Heather went with me to chemo today. We had planned on going to lunch, but spent most of that time before chemo at the hospital getting ready for the transfusion tomorrow. We did go to lunch at this little Mexican place…my new favorite… and just decided that if I was late to chemo, so be it! 😉 We were only about 20 minutes late. Yummy Fish Tacos!!! At the doctor’s office, it is routine for them to check your vitals before chemo and sometimes they won’t treat you if things aren’t at the right levels. My blood pressure – low, but that’s been pretty normal since starting chemo. Then they took my temperature. It was 102.2 degrees. Ummmm, to me it would seem that’s a little too high. I’ve been having fevers, but I don’t seem to have all the symptoms that usually come along with the fevers. So I didn’t look sick but had a pretty high fever. I think they normally wouldn’t do chemo, but my doctor said go ahead, so we did. They also didn’t give me the anti-nausea injection that knocks me out, so I wasn’t totally out of it which was nice. When I was done, my fever was down to a low 101.9. Not down too much at all, eh? We decided to leave the port connected so that they don’t have to do it tomorrow at “My Favorite” hospital. I’ll write more after tomorrow. Today was really busy. Tomorrow will be full, but I won’t be going anywhere except the hospital. There is no one who can stay with me the whole day, so people are coming in shifts starting at 7:45 when Gwynne will pick me up and take me there. 🙂 I have such great friends around me. Last Tuesday, I was sitting on the couch before chemo when the doctor’s office called and told me I needed a transfusion, so when the phone rang yesterday morning, my heart skipped a beat. I was relieved to hear that I wasn’t being scheduled for another transfusion, but for some reason the transfusions, the shots, and the extra iron pills aren’t raising my red blood count to normal levels. I don’t know how much these things are supposed to raise the level, but I do know that the normal range is 11-14, and I was a 7 before the transfusion last week and only 8.4 this week. They told me that they’d be drawing more blood before chemo to run some other tests on it to see what else might be keeping my levels from raising. This was one of the quickest treatments ever. It took just under an hour, but still knocked me out! I slept the majority of the afternoon and evening, which affected my sleeping last night. I was up every 2 hours just laying there awake… (Sol been having a tough time sleeping last few night as well). Other than that, things here are going pretty well. 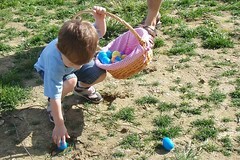 We had a wonderful Easter with family. 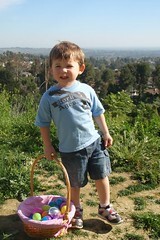 Kai began getting baskets on Thursday and received one every day up to Easter. He LOVED it! 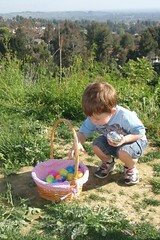 Now there is way too much candy around our house. I have been throwing it away – yes, tossing it. Boy does it take self-will not to eat it or stash it away for a rainy day (honestly, I’ve been eating it so it needs to go!!!). 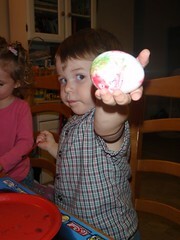 Here are a few pictures from decorating eggs and Easter Sunday. A Lady Bug Friend. 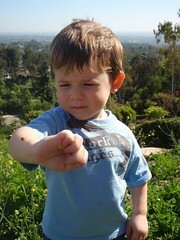 Kai loved having the ladybug crawl all over his arm. We love you all and hope this finds you well. Happy Easter – Christ has Risen – Death has no Victory! Alleluia!! !